Watching Comedy Bang! Bang! is already an exercise in accepting absurdity as it is, but three seasons in, watching it alongside a person who has never watched a single episode and has heard podcast episodes in passing—my younger brother—makes for a truly fascinating experience. It’s a true entryway into the mind of knowing how the show looks to the normal folk. Simply put, it looks like insanity. That’s what it looks like. For a premiere episode, “Patton Oswalt Wears A Black Blazer And Dress Shoes” is rather low-key upon first viewing. Patton Oswalt isn’t the type of comedian to go over-the-top, and watching the moments where he attempts to go outside his comfort zone, playing to the wackiness—specifically his awe during the Ratatouille segment—his performance feels strained, and it takes a little away from the moments. Then again, Oswalt fits right in during the “Agree To Disagree” segment, especially in the aftermath where he asks Scott if he really thinks they’re best friends. It’s a throwaway line, and Oswalt’s best material in the episode is actually those types of lines: Oswalt’s small moments before and after the commercials are things of beauty, from his Matrix discussion to “blah blah blah” to speaking too quietly for Scott or any human to hear him. It’s almost ridiculous to call this episode “low-key” when it begins with an action-adventure movie of a cold open. Right before the action begins, there’s a poster for a movie called Intense Justice, which one can only assume is the title of whatever this is. It definitely looks like the sort of thing to be titled Intense Justice, after all: Just watch the self-satisfied faces of the younger characters as they triumph, and you’d swear you were watching a rated PG action movie produced by Nickelodeon. The most important parts of the cold open though are the pairs of Aukerman/Watts doppelgangers (one of which included Lucas Till in between X-Men duties and Kyle Massey of Cory In The House and Raven Baxter’s little brother fame) and the most amazing green screen since Ringer. Hopefully this third season—and any season in the future—is a safe place for That’s So Raven jokes. But having watched every single episode of Comedy Bang! Bang!, even I had to ask myself “What is going on?” during this cold open. I learned ages ago that asking why anything happens on Comedy Bang! Bang! is counterproductive. Case in point: Why is Reggie’s real name all of a sudden Ryan? Why not? It’s funny. The runner of Reggie’s names really being “Ryan” (and rhyming with “lion”) works, not because of it being as plain a name as it is, but because Scott barely even puts any effort into remembering the name change, er, correction. Since Comedy Bang! Bang! always goes back to the off-balance status quo at the end, of course Ryan gets his name legally changed to Reggie. There’s no reason to question it, because why should we expect anything else? Now for the MVPs of the episode. First up, from the moment “Winner or Sinner” begins, it’s obvious it will only to continue to escalate as the sketch goes on. That predictability doesn’t make it any less funny. Once the sandwich eater comes into play, all bets are off. It’s just too ridiculous, in the best way possible. Sketches like this are the best part of Comedy Bang! Bang! in its television format. “Agree to Disagree” would be completely easy to replicate on the podcast, and even the Ratatouille bit could translate over the metaphorical airwaves, but “Winner or Sinner” only improves with each viewing. That’s always been the best part of these types of segments, even going as far as the pilot with “Tsk Tsk, Attaboy!” Watching a pregnant woman be deemed a “SINNER” for opting to give birth over watching a stranger’s laptop is a fantastic gag, and the climax—surprise martial arts!—is only made more amusing by the return in the end of the episode. Then there’s Dr. Susan Armhold, turtle expert! Vanessa Bayer’s turn as the turtle expert is short but sweet, and if she could do such a character on Saturday Night Live, that show would be all the more better for it. As soon as she goes into a tailspin over her hatred of turtles, it’s a beautiful demonstration in absurdity. “They get away with everything!” It’s possible no one has ever thought about how the Teenage Mutant Ninja Turtles live rent-free, but now it’s probably all anyone will be able to think about. Armhold would made a great guest on Comedy Bang! Bang! the Podcast, though I wonder how long this character could even go on once she has the inevitable breakdown. Honestly, Comedy Bang! Bang! is a difficult show to review, because it mostly boils down to “Is this funny or not?” “Patton Oswalt Wears A Black Blazer And Dress Shoes” is definitely funny—even to a first-time viewer like my younger brother, who apparently is not a Patton Oswalt fan—but there have been funnier episodes in the past. 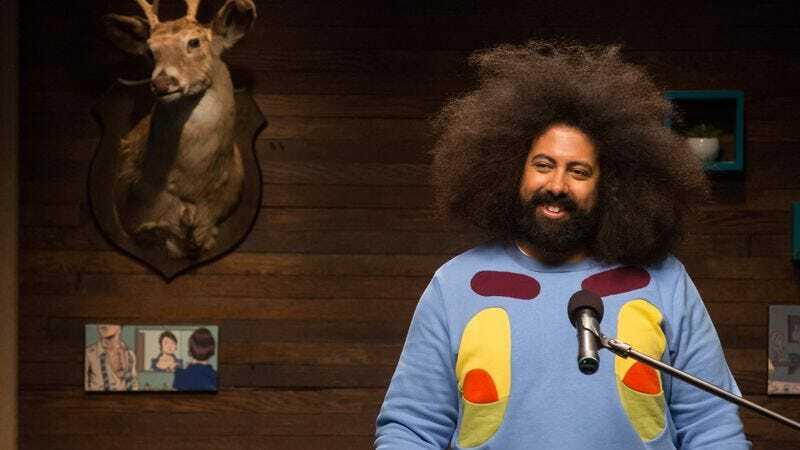 Fortunately, Comedy Bang! Bang! has a habit of building as the seasons progresses, so there’s still a long way to go. Scott’s On-screen Credit: Meet Thefockerman. A reference to a classic trilogy for this, Comedy Bang! Bang’s! third season. Complete with a “you talkin’ to me?” from Ryan/Reggie. One thing the podcast definitely has over the show? Wompster’s University herself, Marissa Wompler (Jessica St. Clair). Based on that character’s description, we’ll probably never ever see her on the show, which is truly unfortunate. “One Turtle Heart” is a catchy tune, especially with the added “You’re a terrible singer.” REMIX! Who wore it better: Ratatouille Edition. Comedy Bang! Bang! or Key and Peele? I will be reviewing Comedy Bing! Bong! now, along with David Kallison and Emily Stephens. Once we get to episode 11, there will be a tally as to which one of us should be killed off, just like in “Rainn Wilson Wears A Short Sleeved Plaid Shirt And Colorful Sneakers.” Vote #davidoremilycbb, #davidcbb for David, and #emilycbb for Emily.